agent3 offer a powerful software platform that provides unique insight on key business accounts, helping to tailor and take advantage of business opportunities to develop more effective Account Based Marketing. We set out to create a video that would highlight how their platform worked as well as exploring the solutions that it provides. As the client was based in the U.S., with an 8-hour time diference, we made sure we minimised any potential communication problems by communicating regularly using videoconferencing and email to make sure everyone was kept updated and feedback was readily available to move the project forward at each stage. Read more on working with long-distance clients. Firstly we had to get under the skin of the software, to see what it could do and how it was used in order to create a script that communicated the benefits effectively. The software was explained to us in great detail, from the type of data it uses to the outcomes and results that it delivers. We were also shown a product demo which helped us to visualise how it was used by customers at every stage. Even with a deeper understanding of the software, there were many approaches that could be used to tell the story. We’re always happy to accept draft scripts as a starting point and on this occasion we received a rough version that we were able to develop in order to offer several versions, creating a version that was more conversational as well as two more abstract alternative poems. Once we had an approved script, we put together a selection of mood boards to determine the style of the video before creating some more project specific styleframes to explore how the final video could look. With a range of options the client was able to visualise the video more clearly, allowing them to pick a style that matched the story being told. Below are a sample of the styleframes that were created for the project, including some experimental & abstract designs. After considering the design options, the client favoured a less abstract approach, focusing on how the software platform worked and the insight that it provided for each client. The script was then transferred into storyboard frames, detailing how each section would appear and what action would take place. We used Illustrator to design the rough graphics whilst assembling the frames in Boords, allowing for extra notes to be added to describe the animation. Although the video would feature a voiceover, the client required the video to also work without any audio. Therefore, we added in stylised captions to make sure that each point was communicated even when audio wasn’t available. The animation was carried out in sections, firstly creating a small section for approval, before animating the rest of the video with the storyboard frames as reference. After Effects was our main animation tool, whilst some additional 3D elements were created in Maya, using Element 3D to add animate them within After Effects. Audio is a large part of the viewer’s experience and should be a consideration throughout every project. 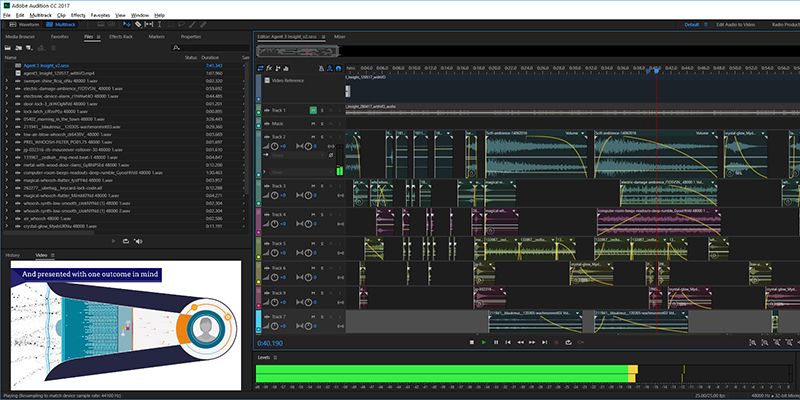 We sourced a range of sound effects to bring the video to life and used Adobe Audition to mix them together, using the video as a reference. This helped to enhance the machine’s power by giving it processing sounds, highlight key moments with an well timed ‘ping’ or ‘pop’ and create an appropriate mood through the right sound track. The client was really pleased with the the final video, taking advantage of it on their trade show stand and using it online to help explain the benefits of their software in more detail.